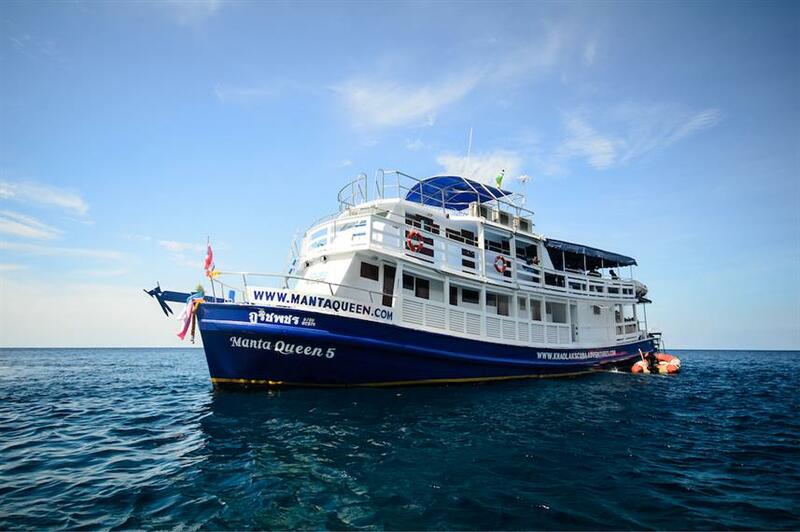 Join the Manta Queen 5 as she explores the popular dive areas of the Similan Islands and Koh Bon for 3-night trips departing every week between October and May. 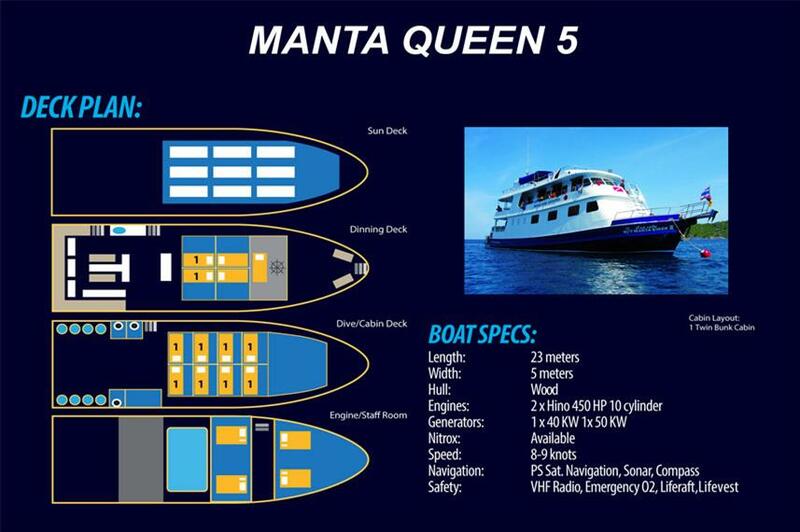 The 23m Manta Queen 5 caters for up to 20 guests in 10 twin bunk cabins with AC, and 3 shared bathrooms. 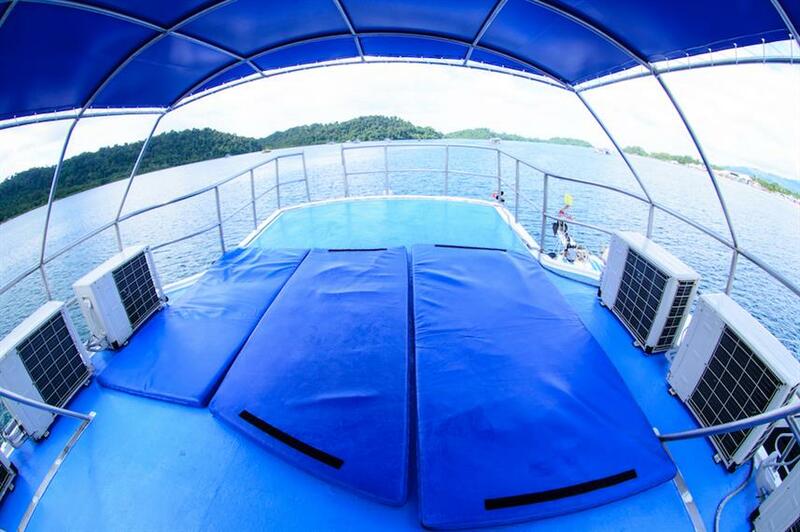 Guests can relax in between diving and snorkelling in the open air dining area or enjoy the stunning Similan views from the roof-top sun deck. 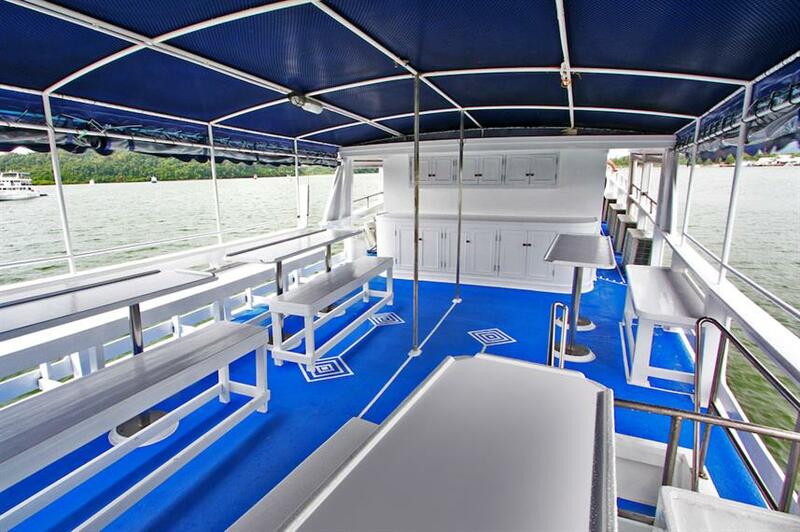 All meals are included and are served buffet style, cooked fresh by the on-board chef. Snacks and fruit are available in between dives and drinking water, tea and coffee are available through the day. 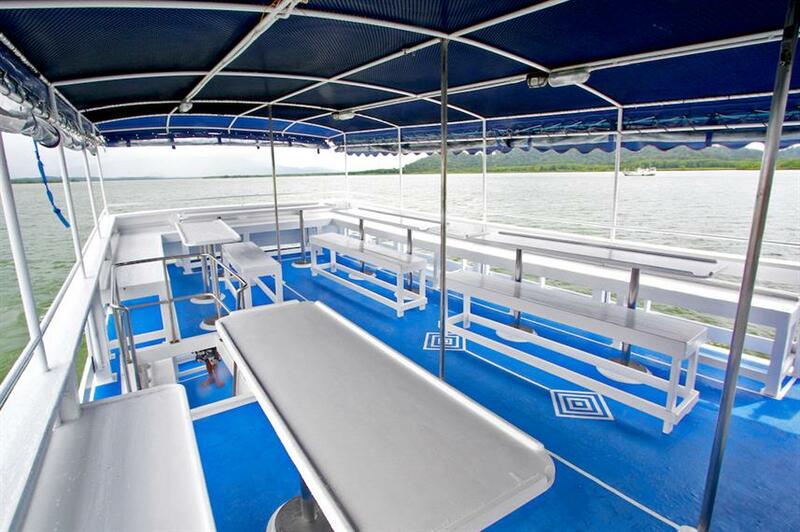 Five dive staff and six boat crew are on hand to help the trip run smoothly. 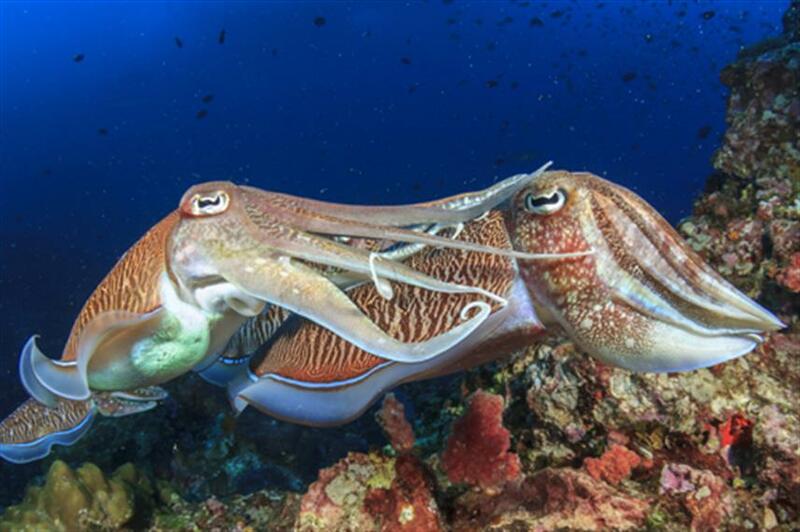 Divers can enjoy the underwater beauty of the Similan Islands at famous dive sites such as East of Eden, Elephant Head Rock, Christmas Point and Koh Bon Pinnacle. 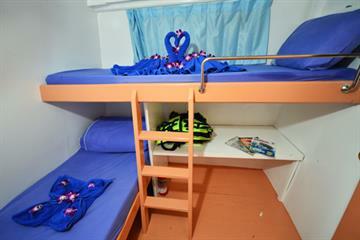 With swim-throughs, beautiful walls and colourful marine life, divers and snorkelers will not be disappointed. Nitrox is available on board for those certified. 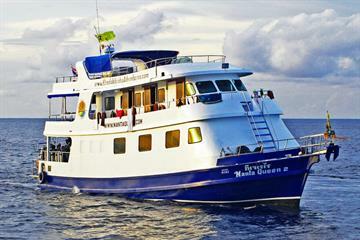 A 3-night trip aboard Manta Queen 5 is the perfect way to experience the Similan Islands in just a few days. Call us or book online now. 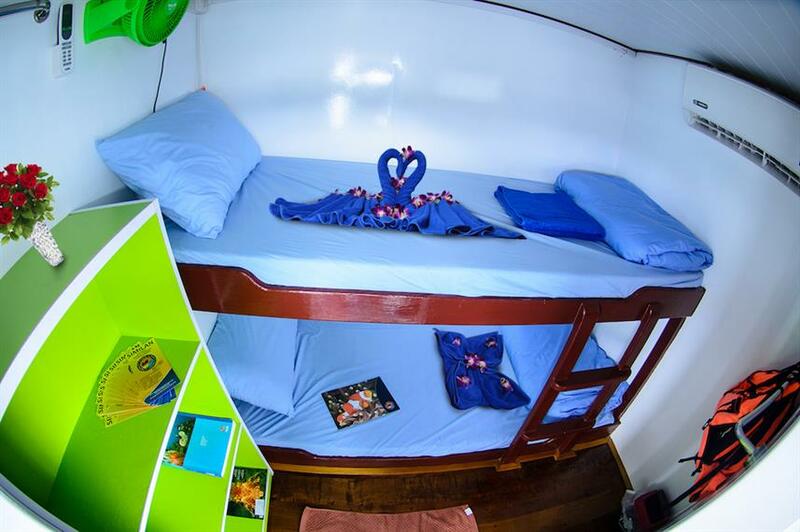 Included: VAT, Drinking Water, Tea & Coffee, Full-Board Meal Plan (All meals), Snacks, Diving Package, Snorkeling Guide, Cabin Towels, WiFi internet. Required Extras: National Park Fees (1,100 THB per trip), Visas and Fees. 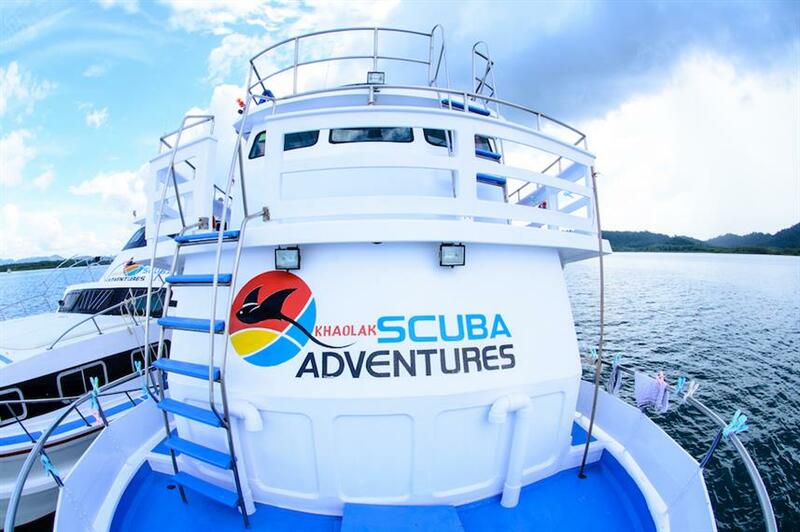 Optional Extras: Dive Insurance (250 THB per day), Gratuities, Airport Transfer (300 THB), Hotel Transfer (300 THB), Alcoholic Beverages, Soft drinks, Extra Dives, Nitrox Course (7,500 THB), Private Dive Guide (1,800 THB per day), Rental Gear (400 THB per trip), Scuba Diving Courses (8,500 THB). The crew speaks English, Dutch, Thai, French, Chinese, Spanish, Danish, Norwegian, Russian, Polish, and Italian. The trip was much better than my expectations. Seeing some amazing little stuff, like ghost pipe fish and juvenile fish. The diversity was wild! They were helpful in pointing out the best areas to go snorkeling. 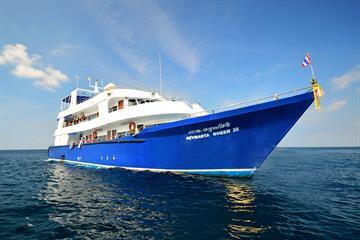 Although the main focus is on diving, the trip was very snorkeling friendly as advertised. The staff was very accommodating during the trip. 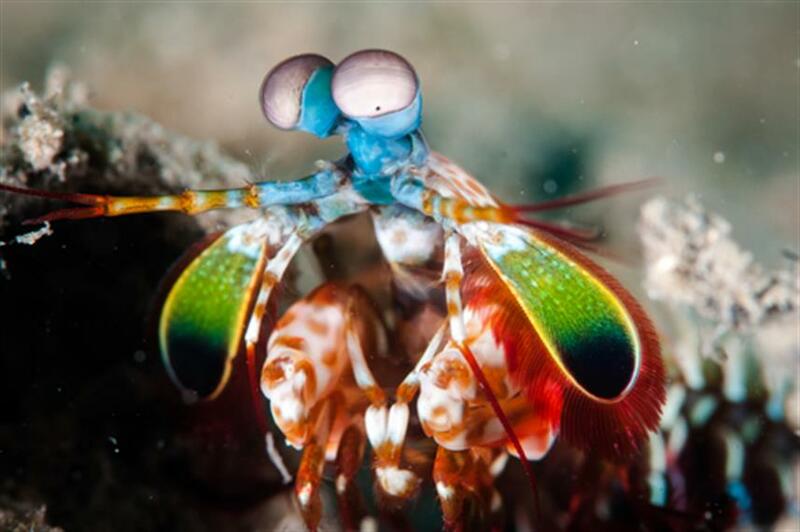 Very beautiful bottom of the ocean. Lots of life. Very friendly people and staff. This is not my first safari but one of the best. great crew. great diving. 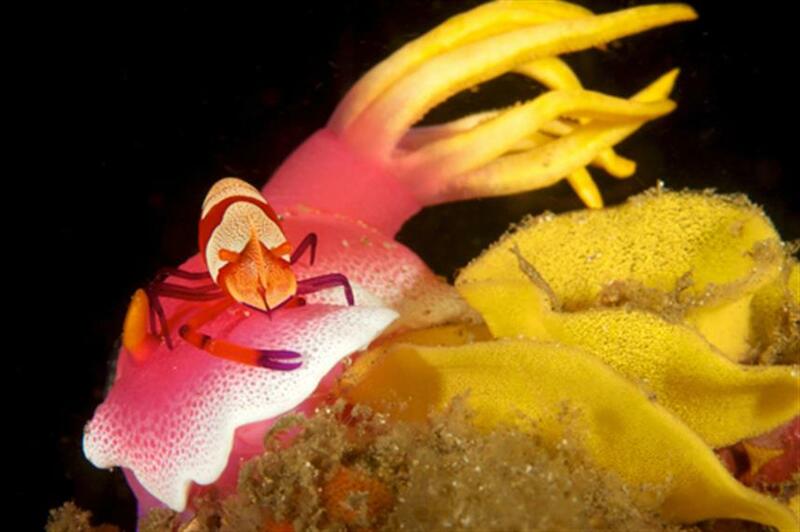 What were the best 3 things about this liveaboard trip? a lot of good food. great crew. good dive places. Diving the Similan Islands was amazing! 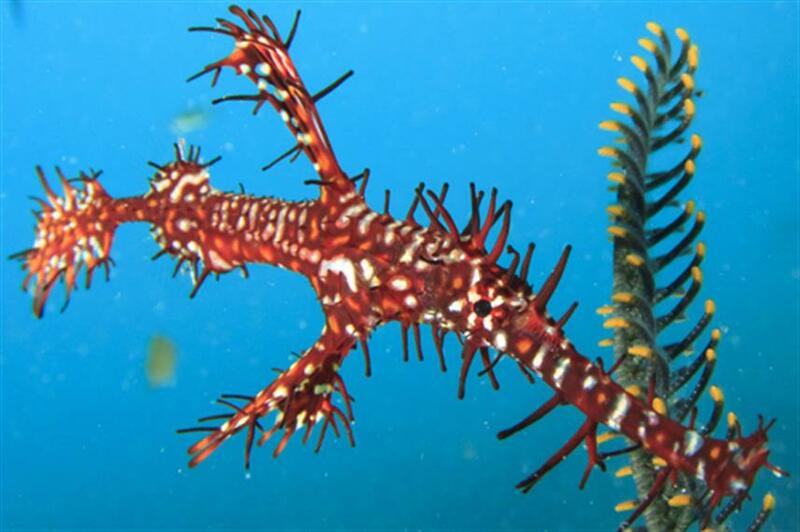 Great dive sights, lots of species we hadn't yet seen, our dive guide Noon was fabulous! The dive locations were fantastic, the food was delicious, the boat boys and cooks were amazing! Alot really , I hoped that I did 5/6 days not 3 only. Great safety , organization, and helpful, friendly. In this diving trip I was able to get Advanced Open Water and Nitrox and take advantage of these certifications and use it towards the dives. The diving instructor, Noon, was very friendly and was around to answer questions about the things we were learning. The boat crew was very helpful always being on time with the meals and also helping us put on our diving gear every time. 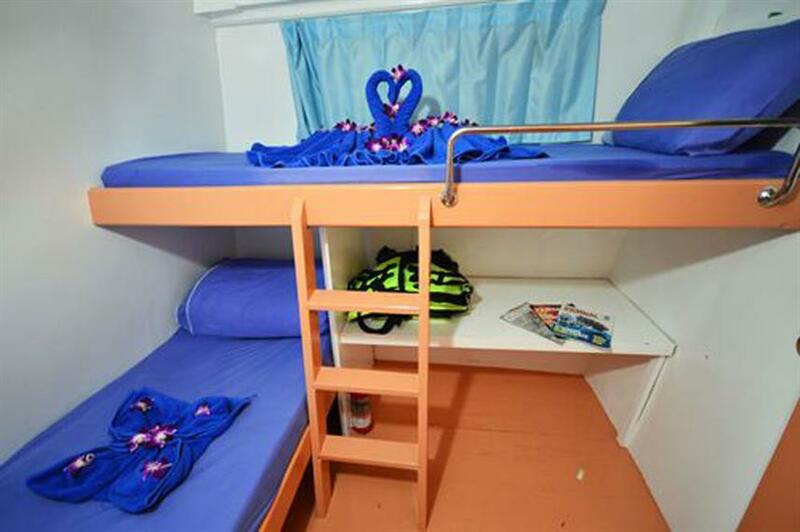 The cabins were simple but bed was clean and the size was appropriate. I would recommend this diving team and the Manta 5 for all my friends. 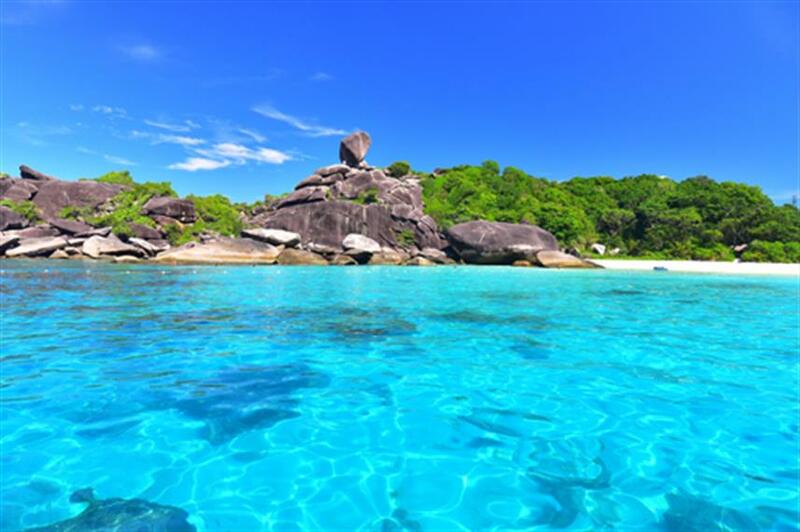 The Similans were beautiful to explore in the beach and under! Good food, good people and great sceneries & diving sites. It was just an amazing experience. But as a person from non-tip country, I prefer when the total price that I pay before the trip is inclusive of all the tips. The overall experience was really welcoming and fun! 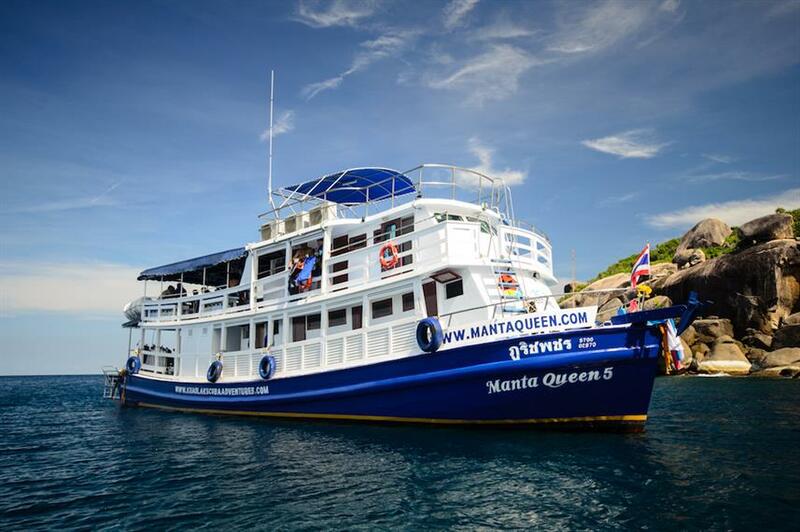 Crew from Manta Queen 5 and Khao Lak Scuba Adventure were really awesome and took really good care of us! Dive Guide! Boat Crew! Everything! 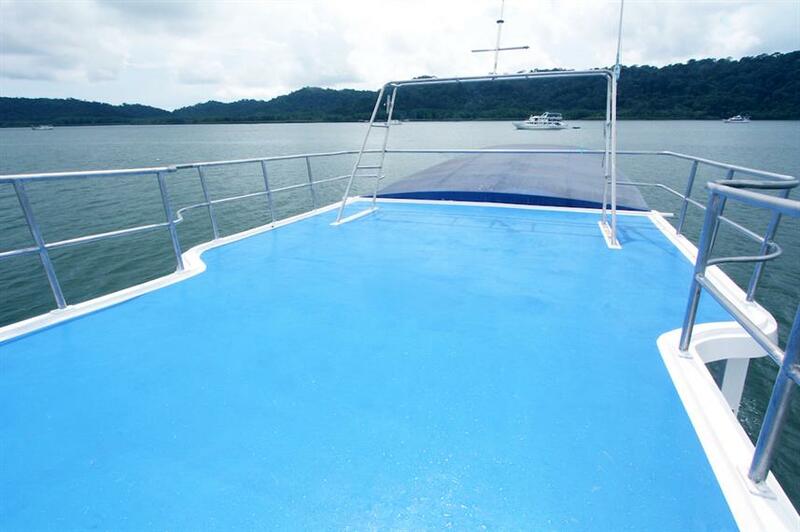 It's a unforgettable diving trip. Ever crews showed their friendliness and professional skill. Dive sites were pretty awesome and the beach would make you fall in love with. 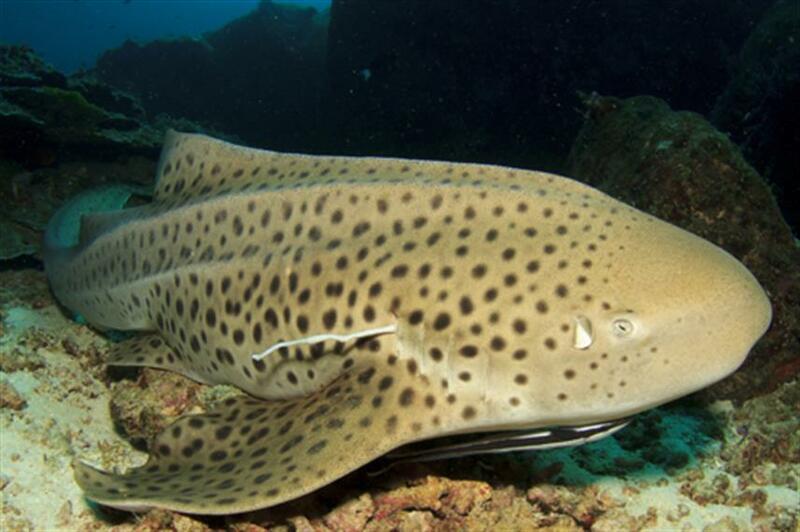 The 3 days trip was easy to join for any kind of divers. Really professional and nice crew! Diving on the similians and the life on board.